Everything you need to know about Broadcast emails. When you go to Broadcasts in the top navigation bar of your account, you'll be taken to the Broadcasts Page. Here you will see all your past Broadcasts, as well as any Broadcast drafts you have. Broadcasts are listed in chronological order from when they were created. You can also search for specific Broadcasts using the Search function! To create a new Broadcast, click the New Broadcast Button toward the top right. The first thing you'll do is select which email address you want your Broadcast to be from. You can change the sender name and email address on a per Broadcast or per Sequence basis. Please note that the replies will go to to the email address you set here. Next, select the Subscribers you want to receive your Broadcast. The Recipient chooser works just like Segments. 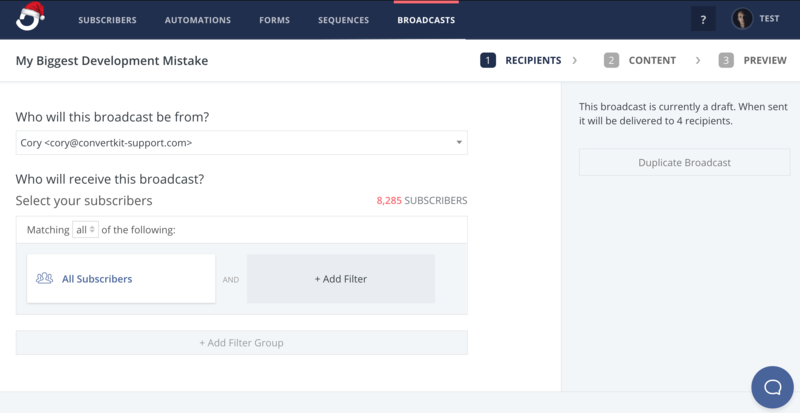 On this page you can choose to whom you'd like to send your Broadcast, or exclude people based on certain Tags, Segments, Forms, and Sequences. 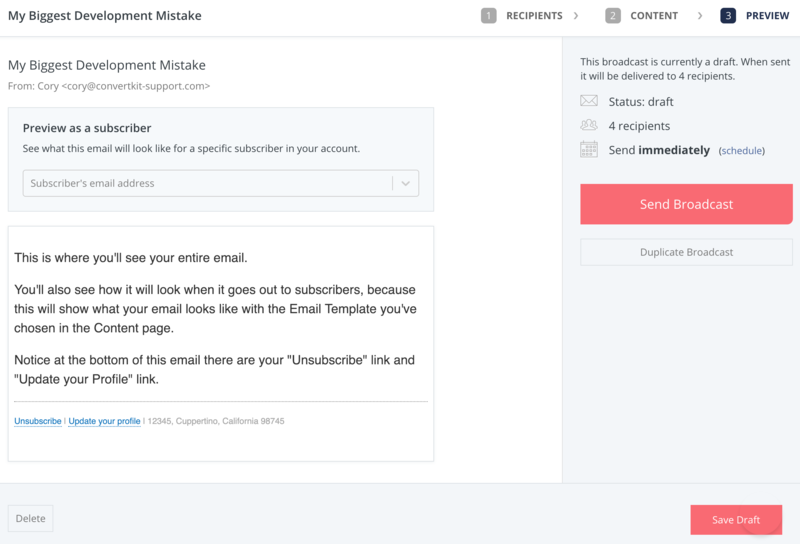 Quick Tip: If you will be sending to same set of rules often, for example send to All Subscribers, but exclude "no newsletter" Tag, you should make a Segment. Then select this Segment each time you send a Broadcast. This is the page where you edit your Broadcast. Here you can write your email and edit the formatting. On this page you can also select your email template, and see both a Browser and Email preview of your content..
On this page you will see a preview of what your Subscribers will see in their inbox, including any customizations added in your template. Click "Save Draft" in the bottom right corner of the page. Click the big red "Send Broadcast" button. Click the red '(edit)' link next to "Send immediately". Choose your date and time, and then click "Schedule Broadcast". 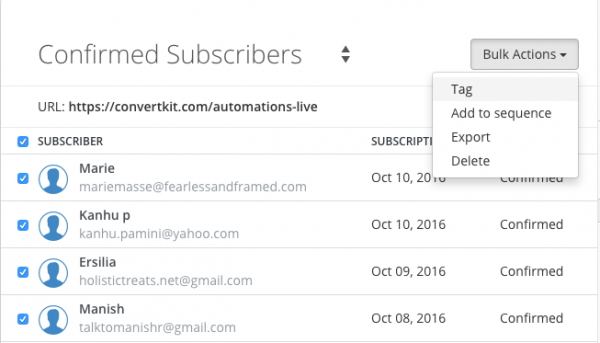 Once a Broadcast has been sent into the world, you'll start to receive data back: your open rates, click through rates, and unsubscribes. This information is available at a glance on the Broadcasts page, but you can also click "View Report." 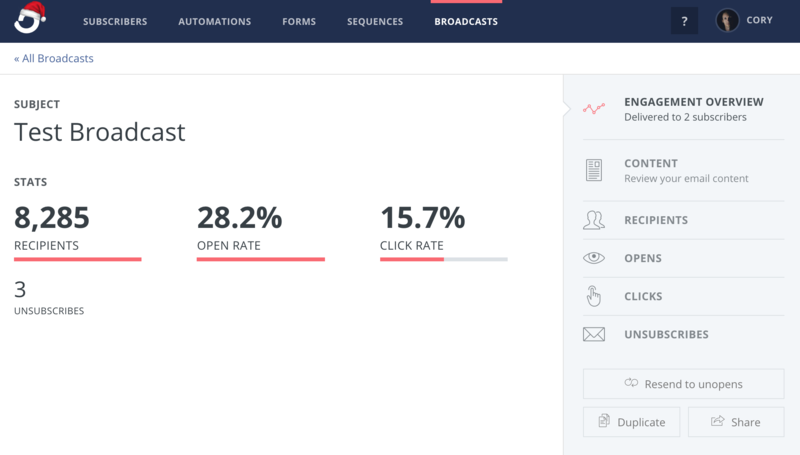 This opens up your sent Broadcast, and now your open rates, click-through rates and unsubscribe totals are clickable, so you can see a report of these numbers. On this page, you can duplicate your Broadcast, create a new Broadcast, or Resend to Unopens. When telling you the click rate for links in a Broadcast, it was always the total for all clicks. Well now it's broken out to show you the click count for each link specifically. Simply click on the Subscriber count in the screenshot above, and you'll be taken to the Subscribers page, filtered down to only show those who clicked that exact link. 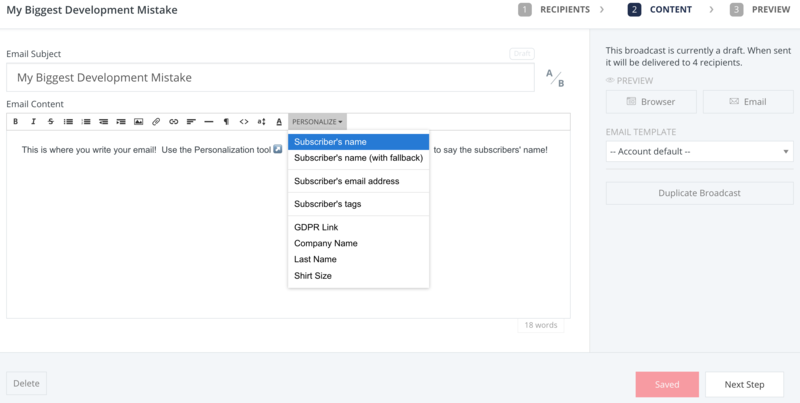 Then select everyone and perform a Bulk Action to Tag the Subscribers (or add them to a Sequence). 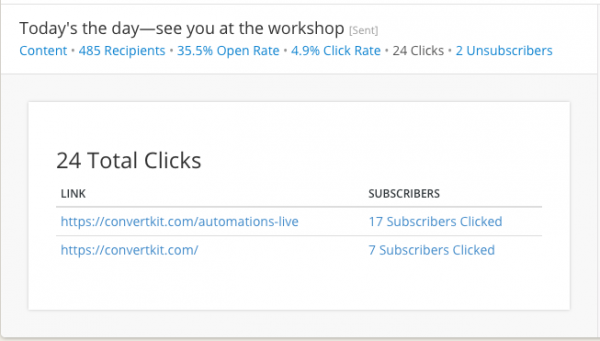 Once you've sent your Broadcast, you can use the Resend to Unopens feature to increase your open rates. This button will allow you to resend your Broadcast to all Subscribers that did not open the first time. When you click it, you'll be able to edit the body and subject of your message, but not the recipients. You can send immediately or schedule for a later date. With our RSS automation, you can automatically create drafts out of new blog posts from your blog feed. Add your RSS feed link on the Automations page. You can set up a single automation, which will create a new Broadcast for each blog post, or a digest, which will create a draft including multiple posts. Please note this will only create a draft, and will not send automatically. When should I use a Broadcast vs a Sequence? Broadcasts are intended for one-off, time sensitive emails. 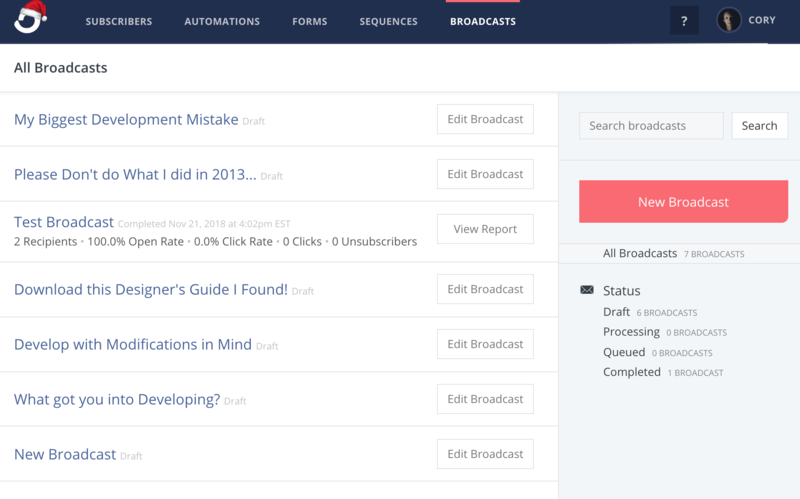 Most of our customers use the Broadcast feature for Weekly Newsletters, RSS Blog Posts, launch information, etc. Sequences are intended to be evergreen. Meaning, for content that is not time sensitive. Can I send a new RSS message automatically? Currently, our RSS Automation only creates a Broadcast draft, it doesn't send without your approval. While this feature is planned, it is not currently available. What timezone is my Broadcast sent in? When you are sending or scheduling your Broadcast, the time is shown in your Browser's time zone, so you are selecting your current time. If you have an assistant or team member working in a different time zone, they will see the Broadcast's time converted to their own time zone. For example, if you schedule a Broadcast for 8AM PST, and your team member is in London, they would see the Broadcast as scheduled for 4PM. My Broadcast says "Queued" or "Sending." Is it stuck? When you press "send," your Broadcast enters a queue. Depending on how many other users are sending messages, and to how many Subscribers, your Broadcasts can take some time to process. We are able to scale up our sending and send more Broadcasts at once, which will speed up sending. NOTE: If you see your Broadcast as Queued or Sending, please do not need to create a duplicate and try to send that Broadcast as well. If you do this, your original Broadcast will be sent, but so will the duplicate.